You need a VPN, and Avira’s here to help. This might be going out on the proverbial limb, but if you’re not using a VPN for most of your internet activity, you might be taking your (digital) life in your hands. A VPN, or virtual private network, acts like your own personal tunnel onto the internet, keeping prying eyes and hackers’ hands off your search history, browsing activity and sensitive data. All possible hyperbole aside, it’s safe to say that you should never enter any kind of identifying or financial information into a website or app without the protection that a VPN affords. With Avira Phantom VPN, you can surf freely, anonymously, and securely. But it’s not just the most sensitive stuff you have to worry about. Without using a VPN, even things like your retail shopping activity, or your most basic keyword searches can be tracked and may end up in the wrong hands. And VPNs aren’t just for security. If you choose the right VPN, it can provide a great way to enhance your online experience – allowing you to boost your internet speed and bypass regional content blocks (so you can still stream your favourite shows while you’re on holiday). Now that you know you need one, which VPN do you choose? That all depends on your needs, your budget, and the sensitivity of your internet activity. While there is no “one size fits all” option, Avira Phantom VPN offers three different plans so you can choose the level of security that’s best for you. Avira Phantom VPN has also gone head-to-head against other highly popular titles in the past and routinely comes out on top as one of the most user friendly, budget friendly, all-encompassing options for securing your internet use. With flexible data plans that meet your needs, Avira Phantom VPN could be the one for you. The plans couldn’t be simpler: a limited free account, a mobile-only account, or an unlimited, “protect everything you’ve got” account. With compatibility for Windows, Mac, iOS, Android, and now a Chrome browser plug-in, there aren’t very many connected devices that cannot be wrapped in an extra layer of anonymous security thanks to Avira. Avira Phantom VPN doesn’t just reroute you through a private tunnel, it actually strips away any identifying aspect to your connection. The IP address masking means your network’s own IP address isn’t connected to your internet activity. That means even your ISP—often the worst culprit when it comes to tracking and selling your demographics and search info—doesn’t know who you are, where you went, or where you connected from. While safeguarding your identity, Avira’s servers (thirty-six of them in 25 different countries) are redirecting your connection to various global points, adding even more anonymity and blocking spying activity. At the same time, these international servers give you the ability to consume your subscription content or access your favorite websites no matter where you are, regardless of the international licensing restrictions or content blocking that can take place when you’re not at home. Browse anonymously and securely on all your devices. Will it protect all of my devices? A lot of users have a variety of tools they need every day, and those tools aren’t always on the same system. Maybe you have a Windows PC, an iPad, and a Samsung phone, for example. For complete VPN peace of mind, you need a platform that will support all of your devices, not just a few of them. Avira Phantom VPN works across all of these operating systems as well as the Chrome browser, bringing the same anonymous surfing capability no matter which device you’re using. But if you’re one of the growing numbers of users who don’t see the need to own a separate computer—after all, you’ve got a tablet, smartphone, and smart TV, plus a computer at work—Avira offers a mobile-only subscription for their VPN that keeps you protected without having to pay to secure devices you don’t even own. Not much, actually. And there’s even a 30-day moneyback guarantee. Avira Phantom offers two choices for its unlimited data and multi-device VPN: a pay-as-you-go £7/$10 monthly subscription with no obligation, or an annual billing offer that knocks it down to £4.30 or $6.50 per month. And did we mention the sale? You can currently get 3 months of Avira Phantom VPN Pro for just 87p or $1.24. Hoorah! There’s also the mobile-only plan that we discussed earlier, available through in-app purchases for just £3.99 or $5.99 per month. Experience Avira Phantom VPN’s incredibly simple interface. Absolutely. Avira provides a free, limited-use VPN if want to be secured on one device for the occasional sensitive activity like filing your taxes or paying bills online. For even better peace of mind, tracker blocking, and international streaming access for longer periods of time though, you’ll want to move up to the paid version. Luckily, this is super easy to do and Avira even provides a useful guide on how to upgrade your Avira Phantom VPN. You can even try the full version for 30 days before you purchase. Great! So how do I start using Avira Phantom VPN? Avira Phantom VPN is built with the everyday user in mind, so it’s easy to download and use. 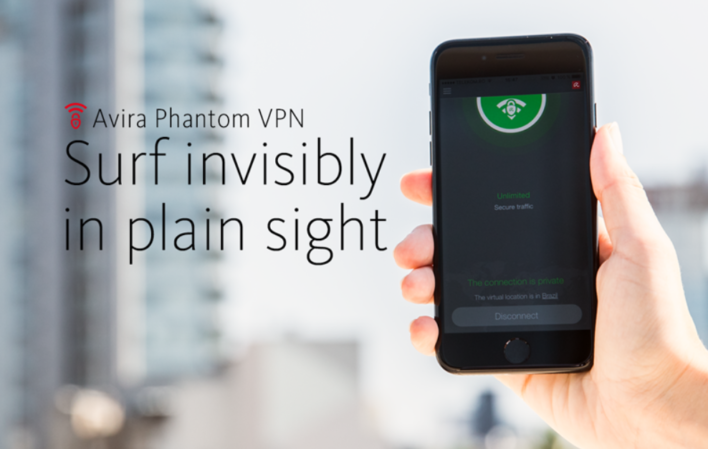 To get started, download Avira Phantom VPN here or search for Avira Phantom VPN in your mobile device’s app store. From there, follow the on-screen instructions to get set up and create your account, and you’ll be up and running with complete privacy and security in no time. To use, simply select your virtual location from the list provided, and connect. And that’s it, you’re good to go! You can turn the VPN connection on and off whenever you like, simply open the app and click connect or disconnect. Get up and running in minutes, and connect with just one click. If you’re looking for a great value, easy to use VPN, Avira Phantom VPN has got you covered. Enjoy the ability to work or play online while knowing that your IP address is not being stored, your search history isn’t being sold to even the highest of bidders, and your paid-for content can be accessed no matter where you go. See for yourself and try Avira Phantom VPN today.